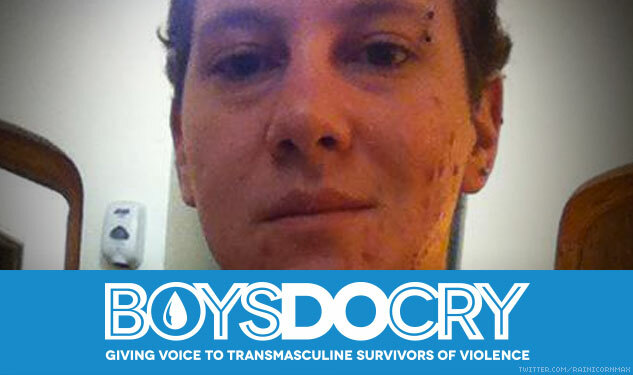 Boys Do Cry: Hatred and fear of transness and femininity undergird most gender-based violence, so protecting trans women will help protect us all. When I was first coming to terms with the idea that I might be a transgender man, I wondered if instead I just harbored a lot of internalized misogyny. What if I wasn't really trans? What if I was just a woman who had so completely absorbed the sexism of our society, both subtle and overt, that I subconsciously hated women and that was why I couldn't bear to be one? I know now that that isn't the case, but still, I worried. And the false "trans men are just self-hating women" claim is still one that's lodged against trans men by many who don't really understand trans people. Thankfully I was able to learn that there were a lot of unfortunate assumptions involved in the way I framed these questions to myself, from the myth that some people are “really” trans while others are just kidding themselves to what trans writer Natalie Reed has called “The Null HypotheCis” — the idea that being cisgender (nontrans) is natural and self-evident, whereas transness always needs to be somehow "proven." This particular framing is still the majority view, even though I've been able to get past it. Being cisgender, the logic goes, is the default; being trans, then, is the “other,” associated with artifice and deception and having to work hard to earn your gender. In our patriarchal society, it's worth noting, trans women are met with many more calls to “prove” their genders because, in a similar way, masculinity is also seen as the default, while femininity is treated with suspicion. When these two “others” — transness and femininity — intersect in one person, they often become the target of what trans thinker Julia Serano termed “transmisogyny”: the suspicion and devaluing of transness and femininity together, specifically reinforcing a specific combination of transphobia and misogyny against trans women and transfeminine people. In its most extreme form, transmisogyny is lethal. At least nine trans women have been murdered in the U.S. so far this year, and in 49 states it is still legal to use the “trans panic” defense for murder — the justification that learning someone's trans identity is so shocking that killing them is an understandable response. Horror and hatred of trans women is not only built into our legal system, but it also pervades society in more subtle ways. Films and TV shows are full of “man in a dress” jokes, which rely on the assumption that any expression of femininity by a “man” (or someone perceived to be a man) is absurd and comical. Little girls who like trains are tough, strong tomboys, but little boys who like princesses are confused sissies who are told to “man up.” The worst insult for a boy is that he acts “like a girl.” In a transmisogynistic society, being trans is punished and being feminine is punished, but nothing is punished more than the femininity of people who are not “supposed” to be women. Transmisogyny not only names the oppression trans women face as both trans people and as women, but it is also an enormously valuable concept for understanding what motivates violence in a patriarchal culture. It is both a specific descriptor and a larger framework for understanding much more about how gender works in our society. In fact, I would argue that the simultaneous hatred of both transness and femininity — transmisogyny — is at the root of much, perhaps even most, of the anti-queer violence in our world. Let me be very clear: I in no way wish to take away from the specificity of the term transmisogyny and the experience of the world, unique to trans women and nonbinary transfeminine people, that it describes. I am emphatically not arguing that people who are not trans women or otherwise transfeminine directly experience transmisogyny. Rather, I believe that transmisogyny is such a strong (and often subconscious) influencer of attackers' thoughts and actions that it underlies many of the ways in which people of all genders are disciplined and punished over perceived gender and sexual transgressions. In other words, while transmisogyny is primarily aimed at trans women and transfeminine people, and it is experienced solely by them in ways that should be discussed without mention of other groups, its prevalence in the world is so widespread that it also happens to “spill over” into violence against others. In fact, a lot of the violence against trans men and transmasculine people — and also against cis men and women who are queer or who are perceived that way — is an outburst of transmisogyny; not a manifestation of transmisogyny outright, but its collateral damage, the unavoidable flipside of transmisogynistic ideas and practices. For example: When a trans man is perceived as a masculine or gender-nonconforming woman and punished for it through an assault or denial of his humanity, he is being attacked for being insufficiently feminine. When a trans man is perceived as an effeminate man and punished for it, he is being attacked for performing masculinity insufficiently. And when a trans man is perceived as trans and punished for it, he is being attacked for performing cisness insufficiently. Violence against trans women occurs under the same perceptions and the same rationale. So while trans men do not have the same experiences as trans women and never could, violence against transmasculine people is still born of the same ideas about gender. This is crucial to realize, because it means that any efforts to lower violence against trans men must inherently address violence against trans women. Violence against men cannot be eradicated without first dismantling the worldview that condones and incentivizes violence against women. Of course, there are additional vectors of race, class, ability, and so on that affect how people are perceived and how violence against them is enacted, and these should not be ignored. Nonetheless, a lot of the gendered violence trans people face has a common root in an attacker's transmisogynistic worldview. The degradation of femininity and the degradation of transness unite in an explosive combination that harms everybody touched by it. So while, for instance, a trans man being assaulted for “sounding gay” might not initially seem like something rooted in transmisogyny — and should certainly not be considered a direct incident of transmisogyny, because it is not done against a transfeminine person — the attack is undergirded by transmisogynistic ideas about how gender “should” be. Naming transmisogyny as the root of all anti-queer violence, including violence against trans men, gives us all the opportunity and the incentive to work on dismantling this specific form of oppression. Queer movements must recognize the pervasiveness of transmisogyny, understand the harm it causes, and center those who are most affected by it: trans women and transfeminine people. Ultimately, if we want to reduce violence against trans women, trans men, and all trans and gender-nonconforming people across the spectrum, eradicating transmisogyny must be a priority for everyone. MAX THORNTON is a graduate student in theology and philosophy, specializing in gender, disability, and technology. You can follow him at @RaincornMax.